Following the massive success of Contra and Ninja Gaiden, NES owners were blessed with many exceptional action titles in a similar vein that hit shelves in the early 1990s. Games geared towards older players like Vice: Project Doom, Power Blade, and Shatterhand put heavy focus on the storyline, character development, huge explosions, and brutal violence. Oniken: Unstoppable Edition is clearly influenced and inspired by this group of terrific Nintendo games. This title, created by Brazilian studio JoyMasher, was originally released in 2014 on Steam, but it will no doubt reach a wider audience on the Switch. 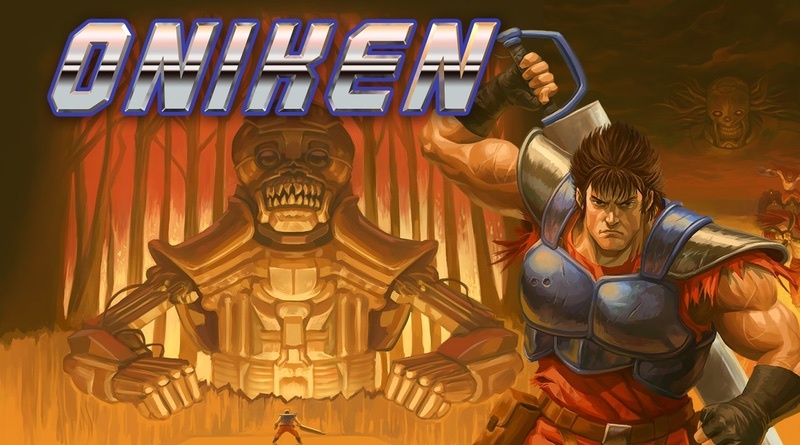 Taking place following a devastating world war, you find yourself surviving in the aftermath where a sinister agency known as the Oniken controls the world with an iron fist. You play as Zaku, a renowned mercenary who is hired by a resistance group in attempt to overthrow the vile Oniken regime. You’ll have to fight through six missions, with short cutscenes interspersed between to unravel the story. These go by fairly quickly and there are no voiceovers. The story isn’t going to keep you on the edge of your seat, but there are some quality characters and the bleak vision of a post-war world keeps things interesting. This game plays very much like most Nintendo action games of yesteryear. Zaku is armed with a sword and you navigate through the areas, slicing up enemies and destroying machines. The only power-ups available are grenades and a sword upgrade, which gives it additional range. In addition to the enemies, levels are filled with environmental hazards such as pits and spikes. There are a few parts where you’ll get into a boat or vehicle that self-propels. During these sequences you’ll be shooting your adversaries rather than using your sword. Each mission features 1 or 2 sub-bosses as well as an end stage boss fight, often a large machine that must be destroyed. You begin with three lives and a health bar. The areas are all quite large and feature several checkpoints, however when you run out of lives you’ll have to begin at the beginning of the mission. Oniken looks and sounds just like you’d expect a later NES game. There’s some nice variety in the areas you visit, such as a forest, an icy fortress, and a battleship. Overall the backgrounds are repetitious and certainly aren’t going to astonish anybody. There are some cool bosses, many of which are enormous, but most common enemies are bland. It does make for a cool visual to see the human villains bleed after being sliced up. I enjoyed the brief animations and the intro video perfectly sets the mood for the game. The music is enjoyable, but none of the tunes are going to stick in your head and fail to live up to most of the NES music from games that inspired this game, notably Ninja Gaiden. Most of these songs seem awfully short and when they reloop, the transition is not very smooth. I had a good time with Oniken, but the game has plenty of downfalls. This game is quite challenging and nobody is going to just breeze through it. However, with only 6 missions a determined player should be able to finish it in a day, and the overall game time clocks in at around 30 minutes once you know what you’re doing. There’s not much for special features, although completing the game will unlock a few extras. The graphics and music are slightly above average and as much as I enjoy throwbacks to the 8 and 16 bit eras, I do expect a little bit more in these departments. After playing amazing games such as Bloodstained: Curse of the Moon and The Messenger, Oniken doesn’t quite stack up. Oniken is a solid 2D action/platformer and I had a fun weekend playing through it. However, it doesn’t do anything extraordinary or original. There are plenty of games that overshadow this, but the $9.99 price tag is perfect and for that affordable price, anyone who picks this up will surely get their money’s worth.